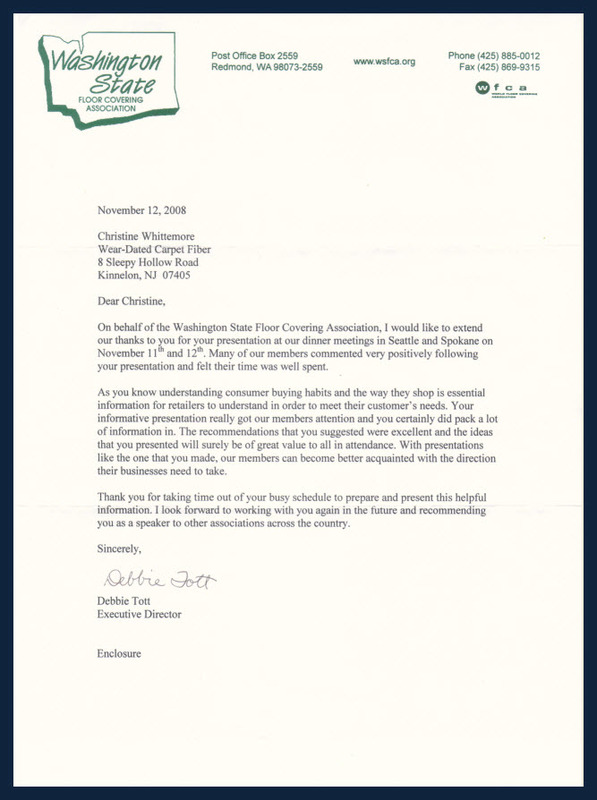 "Christine has been more than a consultant to Tile Outlets of America. Her knowledge, intellect and experience are readily apparent and over the past several years her role has evolved to that of a trusted adviser who has played and continues to play an integral role in the development and day-to-day management of our social media and web site marketing efforts. With Christine’s guidance we have transformed our web site from a dated, static site to a dynamic and vibrant one that responds to our customers’ needs and desires. We also now have a social media presence that reinforces the visibility and effectiveness of our overall Internet marketing presence. 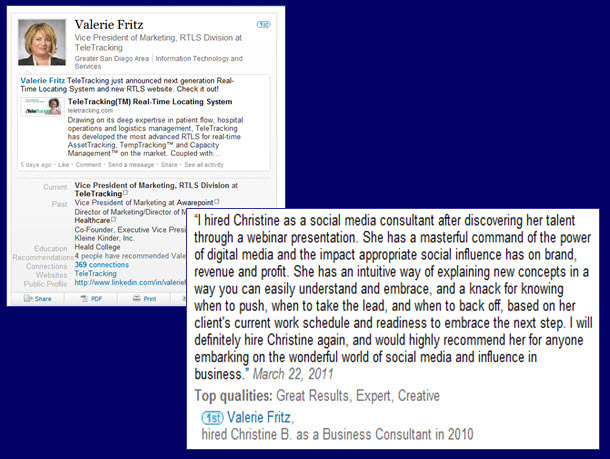 I know of no one in any field of expertise I would recommend any more highly than Christine." "Christine's passion for a great customer experience and no-nonsense approach is smart marketing. Her strong understanding of marketing fundamentals combined with a keen eye and steadfast monitoring of metrics provides quantifiable results that will improve your bottom line. Christine will help you understand what marketing efforts your business should be engaging, guide you there, and show you the results. Her skill sets include social media marketing, content marketing, SEO, PPC and copy righting. One quality that I admire is her ability to understand the time restraints small business owners face while gently encouraging action to achieve results that help your business grow." "Great post, Christine B. Whittemore! Tip o' the hat to you, Nora DePalma! You certainly found one of the brightest, best and most knowledgeable individuals on content marketing. Christine's passion and no nonsense approach to content marketing is a sure bet." "Well said, Bill! Christine is our secret weapon behind the scenes with Mr. Steam. Plus she's so fun to work with!" "We have integrated Simple Marketing Now into several of our clients' businesses to great success. Christine indeed simplifies today's profound changes in marketing. She combines a deep understanding of digital and social with a classical marketer's approach to branding. That's a rare mix of talents and we couldn't be happier to offer Simple Marketing Now services to our clients." "Christine Whittemore is a consultant who can quickly mine years of experience in business and apply it to your individual situation. She brings together a great combination of strategic and tactical thinking, always ensuring tactics match strategy. Easy to work with, generous with ideas, and committed to high standards. Highly recommend." As Vice President of Marketing for TeleTracking Technologies, Ms. Fritz hired Christine Whittemore to implement inbound marketing and HubSpot. As Vice President of Marketing for MEPS Real-Time, Inc., she hired Ms. Whittemore to implement inbound marketing and HubSpot, manage Google Adwords and SEO for her company's website. As Chief Marketing Officer for TAGNOS, Ms. Fritz engaged Ms. Whittemore for inbound marketing with HubSpot and content strategy. And here's another perspective from Ann Zollinger, Owner, North Coast Packaged Homes: How Customer-Focus Helps North Coast Packaged Homes Get Found Online. David Elyachar, Founder, Big Bob's Flooring Outlet of America, Inc. I wanted to take a moment to express our gratitude to you for performing the Keynote Speaker role at our 17th Annual Convention in Chattanooga, Tennessee in January. Each and every member of our organization was thrilled to hear your presentation entitled 'Flooring the Consumer: In-Store and Online'. Our goal, as we built our agenda, was to provide a program that recognized the importance of women consumers and provided a fresh, inspiring perspective. Because of your renowned reputation in the industry and our convention theme "Think Pink and Best Practices" we were pleased that you were available as you were a perfect fit within our theme. Christine, you really hit the mark, exceeding our expectations and providing our membership with insightful, pertinent knowledge to implement changes within their businesses. 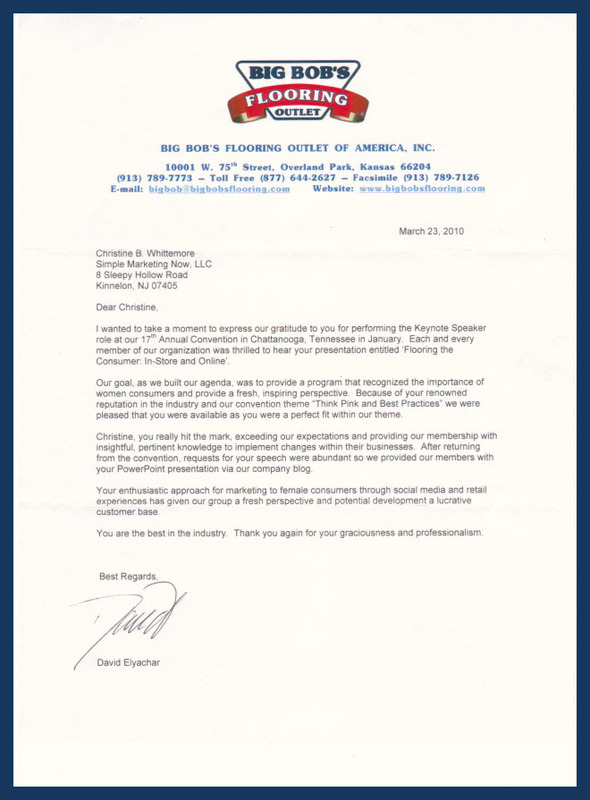 After returning from the convention, requests for your speech were abundant so we provided our members with your PowerPoint presentation via our company blog. Your enthusiastic approach for marketing to female consumers through social media and retail experiences has given our group a fresh perspective and potential development of a lucrative customer base. You are the best in the industry. Thank you again for your graciousness and professionalism. On behalf of the Washington State Floor Covering Association, I would like to extend our thanks to you for your presentation at our dinner meetings in Seattle and Spokane on November 11th and 12th. Many of our members commented very positively following your presentation and felt their time was well spent. As you know understanding consumer buying habits and the way they shop is essential information for retailers to understand in order to meet their customers' needs. Your informative presentation really got our members' attention and you certainly did pack a lot of information in! The recommendations that you suggested were excellent and the ideas that you presented will surely be of great value to all in attendance. With presentations like the one that you made, our members can become better acquainted with the direction their businesses need to take. Thank you for taking time out of your busy schedule to prepare and present this helpful information. I look forward to working with you again in the future and recommend you as a speaker to other associations across the country. Yes, of course there's more! 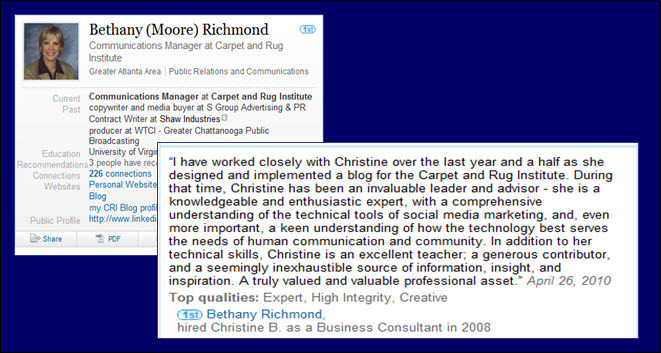 Christine Whittemore was identified as a person driving the flooring industry in 2013 and see Driving Flooring With Social Media Marketing. She is a Fellow of the Luxury Marketing Council Florida after addressing the Luxury Marketing Council Orlando in April 2010. She is one of 25 women to reckon with in flooring propelling the industry, per Floor Covering News. She has been presenting to groups large and small since 1998. Christine served as co-president of the Columbia Business School Alumni Club of New York from June 2011 through June 2013. You can read more endorsements, recommendations and testimonials on Ms. Whittemore's LinkedIn profile. And don't forget to check out "Meet The Simplifier"! What People Are Saying on Twitter!